Spicy Chilly: Ulli Thoran / Stir fried Onions with Coconut. Keralites have a good taste in making dishes using coconuts. More than any other dish we find all around our country,the Kerala dishes have coconuts as one of the major ingredients. Thoran ,the exclusive side dish,is a dry fry variety of any vegetable with plenty of coconut gratings in it.The item is nutritious as well, as the vegetables are chopped finely and gets cooked mostly in its own water content.It has its unique taste when tempered with Coconut Oil. I prefer to make this side dish when I run short of vegetables, unexpectedly. 'Ulli Thoran' is a side dish that goes well with 'Rice and Sambhar' or 'Rice and Theiyal'. Shallots or small onions OR Big Onions cut lengthwise-1cup. Slightly ripe green chillies,cut into rings-1 tbsp. 1. Combine the onions, coconut shavings, ginger, turmeric, curry leaves and salt and mix them gently using fingers. 2. Heat coconut oil in a wok,splutter the mustards and add the above mixture. 3. Close the wok with an appropriate lid,not to allow the steam to escape,and simmer cook. 4. Sprinkle water if necessary and turn it occasionally to avoid burning.Press thoran lightly flat to the bottom to facilitate cooking with minimum water. 5. Remove from fire when the onions are cooked. (evaporate the excess water if present, keeping the pan open, in a medium flame). 6. Serve hot as a side dish to boiled plain rice and theiyal. hey:)thats neat:)when i make ullithoran i add cumin seeds and no ginger.i should try ulli thoran this way,the pic looks so good.wish i could have some of that!! now i am hungry:(. ulli thoran looks so good with rice. 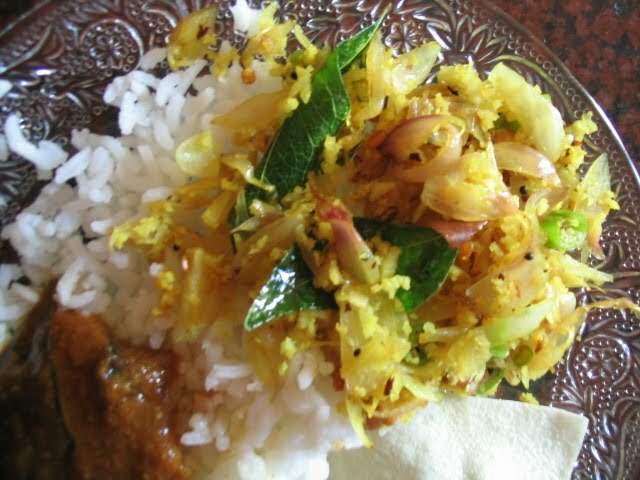 Hi meera,Reena and Asha,..Shallots are easily avlble at your place and this is an easy dish...Finely cut big onions too comes out well,and meera you can also use jeera and a red chilly with a tbsp of grated coconuts,ground coarsely altogether,fry and add onoins then...it's again a variation..
awesome job! i am so glad u r almost as passionate as me about blogging. glad u got over the initial inertia. way to go! My favourite Thoran..The aroma itself makes us to have a fullplate of rice,right?? I am new to krrala cuisine. This recipe sounds good. Can you please post Aapam . Thanks. hi first time here! and also the first time I've heard or even seen an ulli thoran. But it looks so yummy I am going to try it out today!! Chanced upon your blog when I googled for chakka ada - I've posted a similar recipe myself and added your link. pls. check it out when you can!